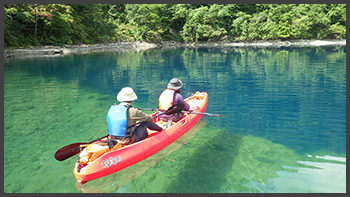 Come join our Kayak Tour at Lake Shikotsu where you can visit this wild-paradise only 80 min. from Sapporo, and 50 min. from New Chitose airport! 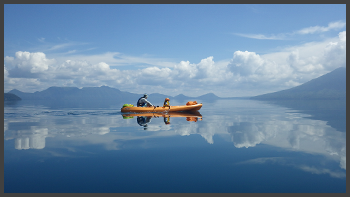 Our "sit-on-top kayak" can provide you with a safe, fun and easy cruise. Our program includes not only kayaking, but also nature watching and snack-tea time. 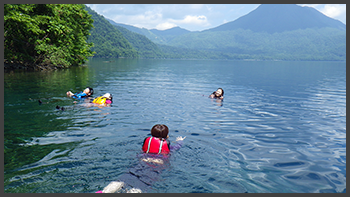 After the program, you can enjoy Onsen (natural hot spring) at Shikotsu or Kitayuzawa area. We also have a restaurant and a local produce market nearby, so you can enjoy whole day at this beautiful national park site. Guide fee, accident insurance fee, tax, snack and tea. Please pay by cash (yen only)　on site. No credit cards please. *If you are unsure about what to wear, please consult with us. - Because of possible drastic weather changes the program may be cancelled or the course changed. - Please follow the guide’s instructions at all times. 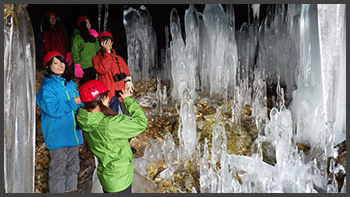 Snowshoeing Tour to the Cave of Ice-Stalagamites. Enjoy a stroll through the forest in snowshoes! Experience the vast wintery nature. Slide down the natural snow slope, listen to the birds and the sound of the stream. Your goal is the unexplored regions of Ootaki! 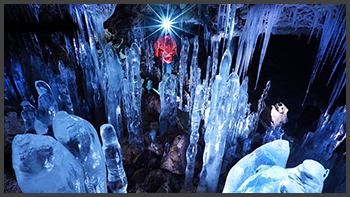 Discover the world class 5000 Ice- stalagamites. Please pay by cash （yen only） on site. No credit cards please. *Free equipment rentals available. Please inquire in advance. Add an extra satisfaction to your trip to Japan. Why not visit Ootaki, Hokkaido, where you can find yourselves in a nature wonderland. Ootaki is a place between Sapporo, New Chitose Airport and Niseko, and it's full of vast nature. You can enjoy outdoor activities all through the year. OOA's outdoor programs are all unique and different, so you will surely be satisfied with our adventurous activities! I’m a pure “Dosanko” a local Hokkaidoite. I had lived in Northern California, USA for 15 years. Also visited many countries like Indonesia, Finland, Mexico and so on to experience outdoor trips. 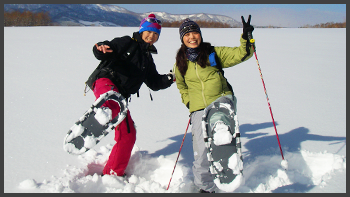 I enjoy surfing, diving, back country skiing, kayaking, camping, snowshoeing and many more outdoor activities all through the year in this wonderful field of Hokkaido. I look forward to meeting outdoor maniacs from around the world! Copyright(C) OOTAKI OUTDOOR ADVENTURES All Rights Reserved.